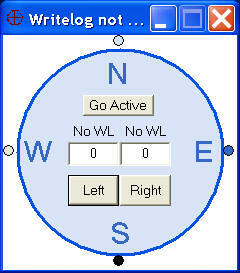 RFW (Rotator for WriteLog) is an add-in to WriteLog for giving precise control of antenna rotors. The current version is the first. It works for me, but has not been tested outside my shack. I suggest a little testing in your own setup before a contest starts. Since it is working through WriteLog you should make sure WriteLog is controlling your rotor successfully before trying RFW. It works for one or two rotors. 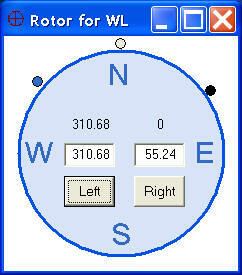 You can click with the left mouse button and a marker will appear around the compass rose indicating the new azimuth for the left rotor. Clicking the "Left" button will then cause WriteLog to move the rotor to that azimuth. 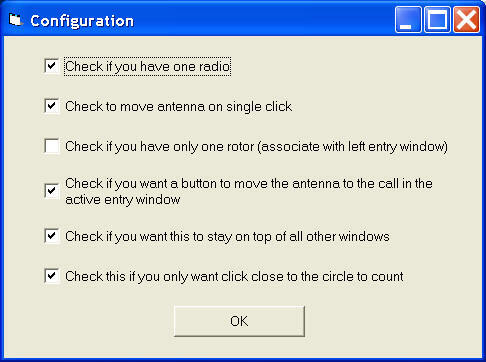 Similarly clicking with the right mouse button will select a new azimuth for the right rotor. You may also enter an azimuth (0-359) into the appropriate edit box. A light blue marker indicates the current position of the left rotor which a dark blue marker indicates the proposed new azimuth. For the right rotor gray and black indicate the current and proposed azimuth. A configuration dialog allows you to setup RFW according to your station configuration and tastes.